Rajiv Jhangiani makes a case for free and open course materials in very personal terms. As a student at the University of British Columbia, he and his cash-strapped roommates fashioned “pretend furniture” from sheet-covered cardboard boxes. When his roommates wanted to add a second phone line for dedicated dial-up Internet access, Jhangiani couldn’t afford the extra $8 a month. His grandfather, who had taken in Jhangiani in Bombay after his father died and his family lost their home, was paying for his schooling. There was no room for frivolous expenses. 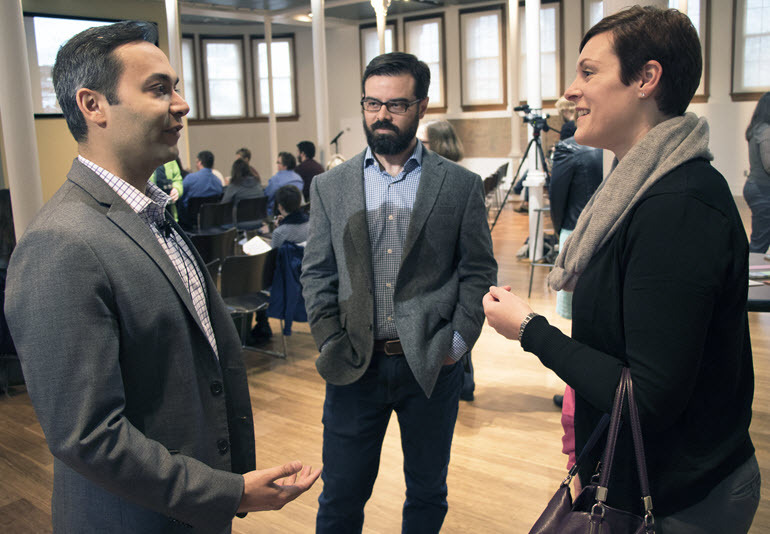 Rajiv Jhangiani, left, with Josh Bolick and Erin Ellis of KU Libraries. He uses his experiences to illustrate that the high cost of textbooks and other course materials are not an abstraction. With state support for higher education declining and tuition rising, many students are forced to work more hours to pay for college. A rising number are relying on food banks for basic nourishment. Two-thirds take out loans. Jhangiani, a university teaching fellow and a psychology instructor at Kwantlen Polytechnic University in Vancouver, B.C., spoke at KU as part of Open Education Week. He stressed the close ties between open educational practices and social justice, mixing the personal and the practical as he made a case for embracing free and low-cost course materials. College instructors long ago ceded academic freedom to textbook makers, Jhangiani said, and follow an absurd approach of mapping their courses onto textbooks rather than the other way around. That has given textbook makers power to charge more than $400 a book in some cases, creating what Jhangiani calls a “second tuition” for students. As a result, students do a sort of cost-benefit analysis with course materials. If they can get by without buying the materials, they will, even if it means a lower grade. If they must buy a book, they search for an older, cheaper version or a pirated online version. The cost of course materials has a real impact on learning, Jhangiani said, and instructors need to pay closer attention to the costs of materials they assign. He advocated for the use of open educational resources, which are often known as OER. Those resources are not only free but can be remixed and remade to fit the needs of students and instructors. Many people have the perception that something free isn’t as good, he said, but much time, effort and even peer review goes into making OER materials available. He cited recent research showing that students who use open resources have lower withdrawal rates and higher course grades. They are also enrolled in more courses each semester. One of his own studies found that students who used open resources scored about the same on exams as those who used traditional textbooks, with one exception. Those who used open resources scored higher on the first exam, largely because they had access to the course material immediately. Jhangiani urged instructors to go beyond open educational resources, though, and to adopt open pedagogy, which involves having students create materials that others can use, an approach he called “renewable assignments.” Those involve everything from writing op-ed pieces for newspapers and websites to creating Wikipedia entries and YouTube videos. Only a fraction of students read the feedback instructors provide, Jhangiani said, providing little benefit to students or instructors. Jhangiani with Carl Luchies and Molly McVey from engineering at a workshop last week. Alternative assignments offer more incentives for students to complete the work, he said. Students often take more time and care in completing them because they know the work will be on display for others to see and use. “I’m amazed at how much pride students put into these assignments,” Jhangiani said. These types of assignments also help students think more critically about sources and write more concisely, he said. They improve digital literacy and allow students to collaborate with others from around the world. They also help students work across disciplines, bringing together concepts and approaches from other classes. When taking that approach, he said, it is important to give students control over their work. Let them choose Creative Commons licenses they are comfortable with. Allow them to later remove online work they decide is inferior. At the same time, scaffold assignments so that students gradually build skills and improve their ability to produce high-quality work. These open assignments, he said, are not just about meeting the goals of an individual course but about helping students become better citizens. Again, Jhangiani speaks from personal experience. As a student, he was intent on excelling academically and making his family proud. He eventually got a job to help him pay his tuition, earned a Ph.D. and became a Canadian citizen. That’s why open education is so important. It provides a means of lowering costs and helping more students earn a college degree. “I sincerely believe that higher education is a vehicle for social mobility,” Jhangiani said. His personal journey illustrates that. KU Libraries has an excellent guide to finding open educational resources. 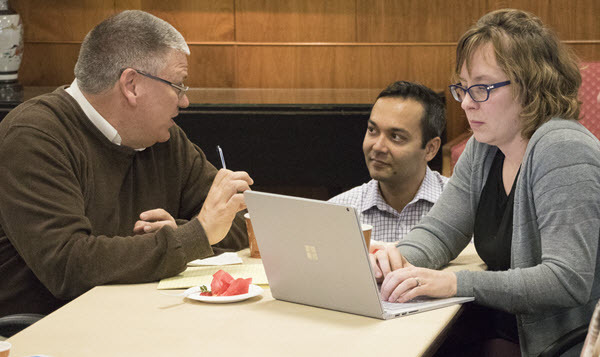 The Shulenburger Office of Scholarly Communication and Copyright also offers grants to support adoption and creation of open educational resources. OpenStax, a nonprofit based at Rice University that provides open textbooks. Open Textbook Library, which has nearly 400 books available. Based at the University of Minnesota’s Center for Open Education. Noba, a free online platform for open textbooks. Open Education Consortium, a consortium of universities promoting open education. Open, a new book by Jhangiani and Robert Biswas-Diener on the philosophy and practice of open education. It is free to download. WikiEdu, the Wiki Education Foundation, which helps instructors integrate Wikipedia assignments into their courses. Tagged college costs, future of higher education, open education.